Home > News > FINAL Coral Sea Marine Park Proposal Released - What does it mean for Spearos? 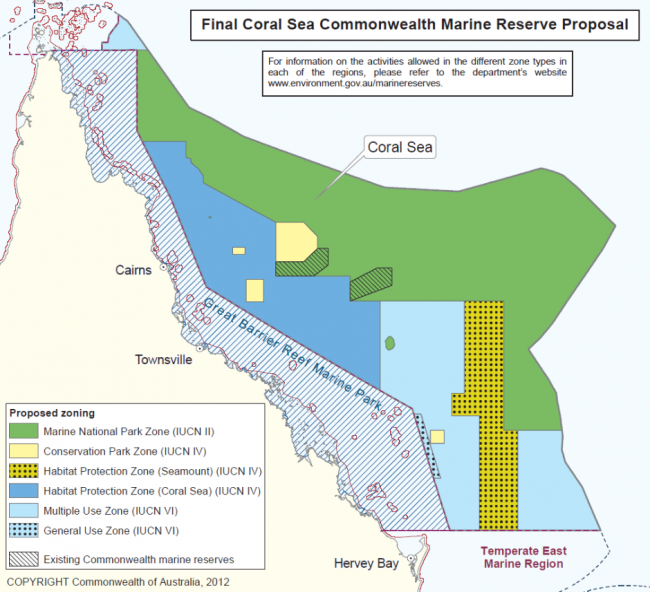 FINAL Coral Sea Marine Park Proposal Released - What does it mean for Spearos? The final Coral Sea Marine Park proposal has been released - and there are mixed feelings on the outcome. It was inevitable that some compromise would have to be made between the Greens and us spearos. The new proposal does eliminate some of the ridiculous rules such as 'you can only take what you're going to eat on the trip' - instead, spearos are now allowed access in those areas, restricted only by the usual Queensland size and bag limits. This is a great result and opens up reefs like Saumarez again. Adreno recently did a week long charter trip to Saumarez and had an unreal time with Dogtooth Tuna, huge Yellowfin Tuna, and more reefies in shallow water than you could poke a spear at. It was amazing and so we are very glad that we will be able to return to this pristine spot in the future. However, it is with great sadness that we announce that some of the best reefs in the Coral Sea will no longer be open to spearfishing. Reefs where many, many World Record and Australian Record species including monster Dogtooth Tuna have been taken. Reefs like Osprey, Shark, Vema, Bougainville and Marion will all be included in the 'Green zone' on the map. The compromise reached here is that we are still allowed access to the deepwater Western sides of these reefs - however, how productive these areas are is open to debate and some have said that this area is basically a bunch of nothingness anyway. So with this announcement, Adreno has decided to run a charter trip to these reefs - a final farewell to the BEST that the Coral Sea has to offer. It is sure to be a trip to remember forever and while we are sad that it will be our last time there, we are at least happy to have the chance to say our goodbyes to the world's best diving spots. There are very limited spots available, but if you would be interested in joining us on this trip in February 2012, simply send an email to kahlee.andrews@gmail.com or get in contact with me via Facebook.